"Looking across the beautifully landscaped Mall in one of the largest planned shopping centers in the nation. 5,000 chrysanthemums are planted here yearly." Is that a fountain on the right or just some errant sprinklers wasting water on the sidewalk? It's hard to tell! Marshall Field's facade is very interesting -- I wonder what material it is. Captain, there be whales here! Fooled me for about 2 seconds as well. No, actually it appears to be your standard outdoor fountain with 5 geysers (presumably more out of frame) and a concrete observation deck hanging over it. The Lantana looks to be in full bloom. That dark facade reminds me of a defunct department store chain called The Treasury. Is that mall sprawling, or what? Could get lost in a place that size. Marshall Field & Company's facade looks to be stone and brick veneer with aluminum and glass fills. It's pretty sweet. 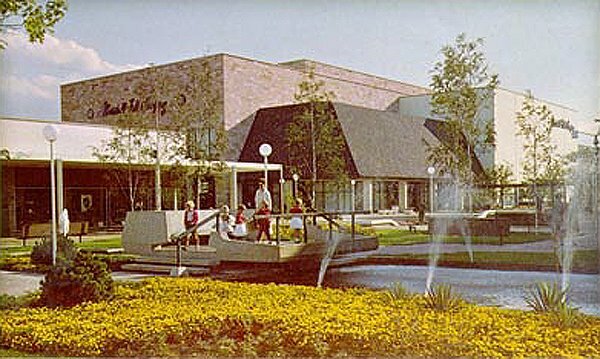 Oak Brook Shopping Center is one of the few thriving "big old malls" in Chicago area. Old Orchard is it's sister. We called them 'shopping centers', until the 80's when 'mall', arrived from Valley Girl lingo. Then most SC's changed their names to 'Xy Mall', even if it was tiny. I worked at Marshall Field's 1985-86, and it was always busy, except January. No comment on the new name of Macy's coming soon. It is still as busy as ever, and no signs of a 'deadmall' at all. Some of it is well presereved from 1960's, too. Yes, this is a great mall. It was very similar in look and layout to Old Orchard. I haven't been here in years. This is a beautiful and thriving mall. I was just there tonight. They keep the flowers and landscaping in good shape. The Marshall Field's name is transitioning now to Macy's throughout the store. Oak Brook is pretty much intact today. There've been the usual changes - including the forthcoming gut-wrenching Macy's switchover. The biggest change I remember from my childhood was the addition of more parking underneath the mall proper and/or easier access to it. The mall's gotten bigger, but is certainly not the size of a Woodfield. Great place, particularly at Christmas.